This soup is really easy to make and very delicious!! I’d never had anything like it!! 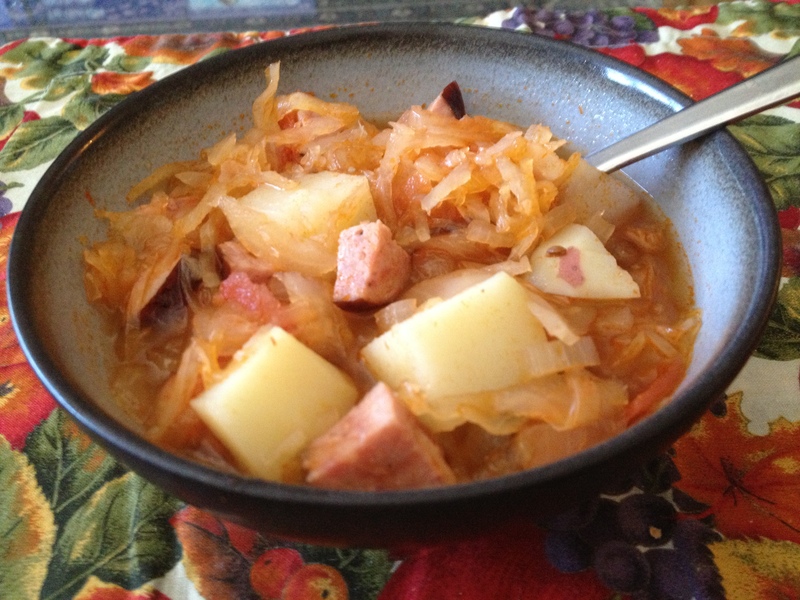 Tart sauerkraut, yummy kielbasa, potatoes and onions-how can you go wrong?! 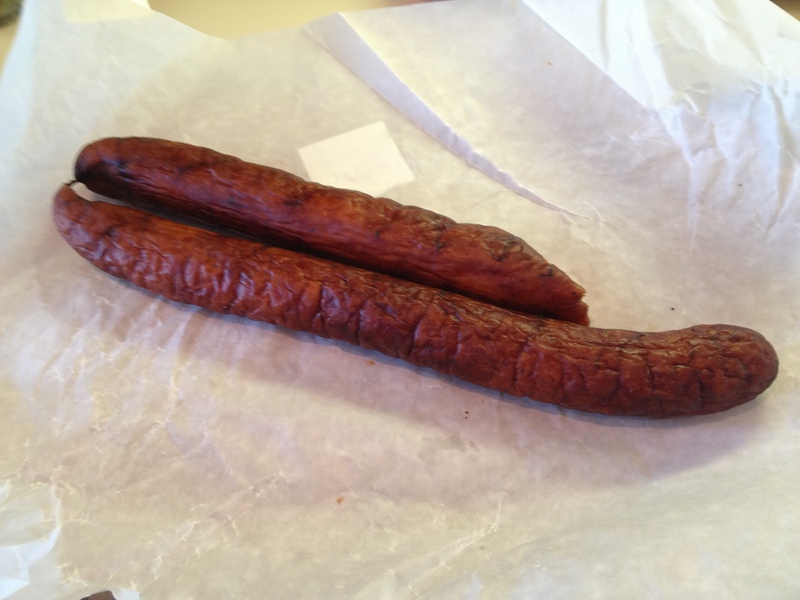 This is the time to go to your local Polish shop and get the best kielbasa you can. While you can use the regular supermarket ones using a great kielbasa really makes such a huge difference. Don’t forget they freeze well so you can buy a lot and keep them for later too. 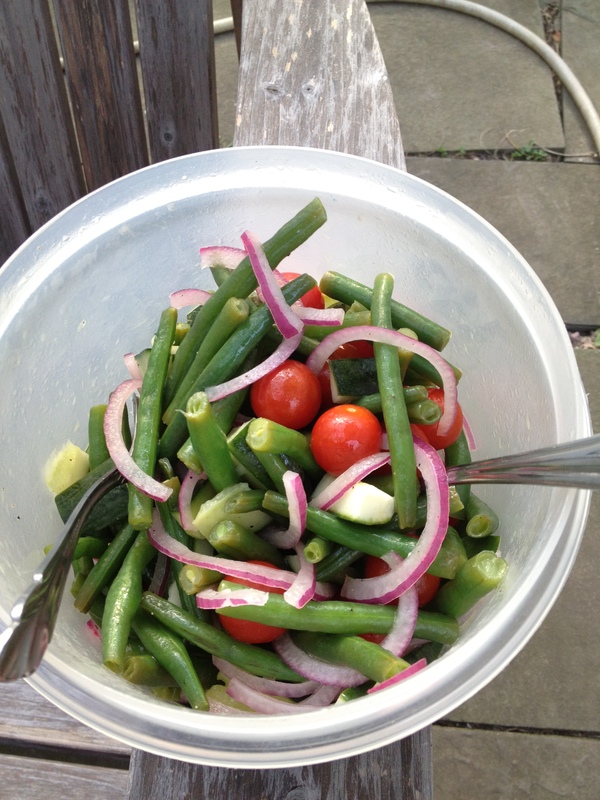 Since we got a big snow storm on Friday night/Saturday I made this for lunch on Saturday and it was perfect. What a delicious meal on a snowy day. 1/13/14 Note: I made this soup this past Saturday morning. The tomatoes at the store didn’t look very nice and I knew that I had a can of tomatoes in the cabinet at home. The result is a variation that I think I like more than the original. It makes more of a tomatoey broth. 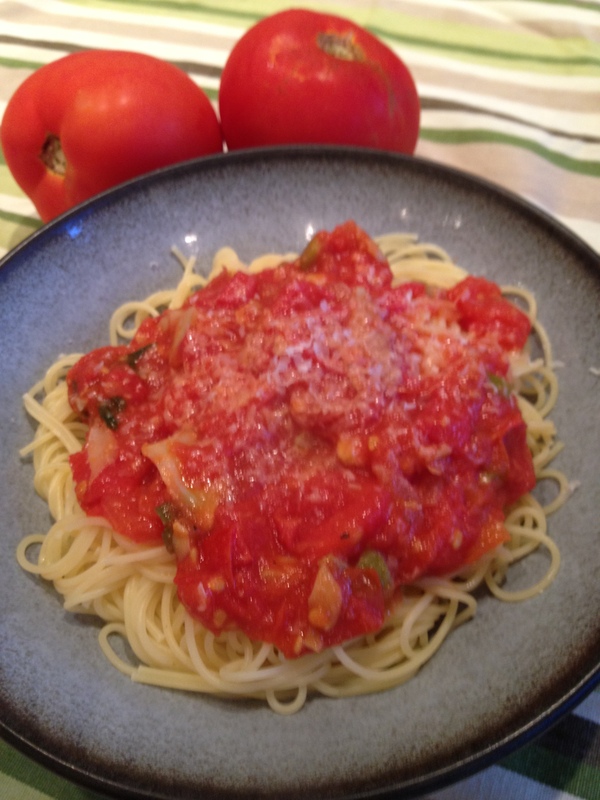 15oz can crushed tomatoes and their liquid—omit both the plum tomatoes and tomato sauce below. 1lb kielbasa-the best quality you can find, cut into 1/4 inch rounds, then in quarters. Add enough water to the reserved sauerkraut liquid to equal 8 cups. Place the sauerkraut, water, kielbasa, caraway seeds, black peppercorns, bay leaf, tomatoes and tomato sauce into a large stock pot over medium-high heat. Bring to a boil then reduce to a simmer. In a small pan saute the onion and garlic until soft then add it to the soup pot. Place potato cubes in a pot and cover with water. Bring to a boil then, when just before cooked fully, drain and add to the soup pot. Return the soup to a boil then reduce to simmer for an hour. Here’s the kielbasa I used-just over 1lb. If you have a little more or little less it’s fine. Note: This soup freezes well so feel free to make extra and put it away for a later lunch or dinner. 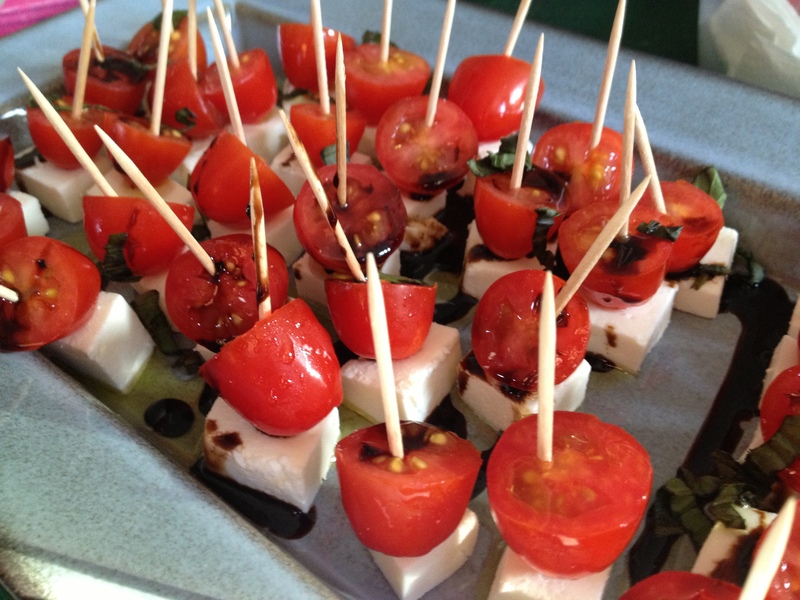 My friend Michelle gave me her recipe and I’ve adapted it to this-enjoy!! While I was out on the East End this past Sunday with my Mom and Grandma we stopped at Harbes Family Farm which is one of the many farmstands along the wine trail. I picked up a few beautiful tomatoes and a pumpkin. I wanted to make some sauce using a few of the tomatoes so I looked through my fridge and cabinets to see what I could add to those sweet, wonderful smelling tomatoes. The outcome was a fresh sauce that just bursts with amazing tomato flavor. It was easy to make and was absolutely delicious. In a large skillet heat the olive oil over medium heat. When hot add garlic and sautee until golden and fragrant. 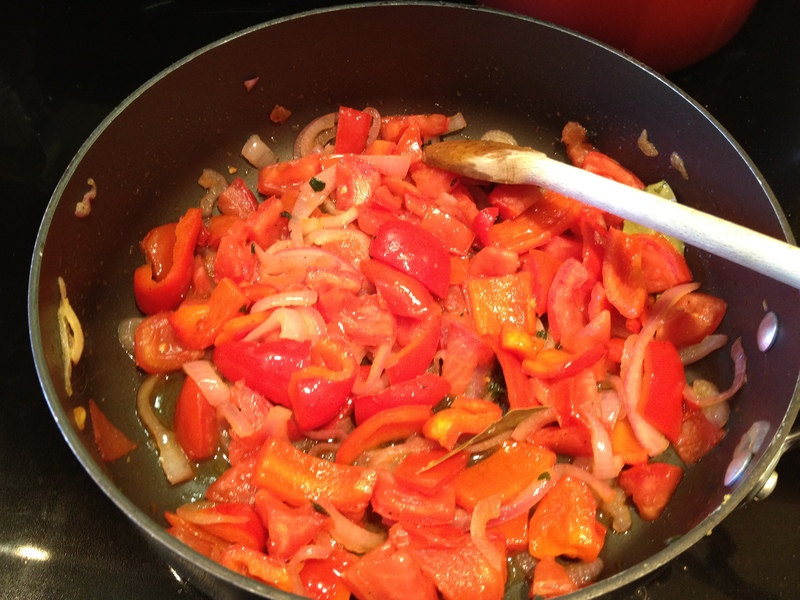 Add onion, olives and artichokes and cook until they start to soften-just a few minutes. Add the remaining ingredients except for the cheese. Bring to a good steadybubble then reduce heat to simmer and stir occasionally until tomatoes are soft and can be smashed with a wooden spoon in the pan. Add cheese, cook for another minute or two and then serve spooned over the pasta.